Not too late. Yes, only two weeks away, but you can still join us. Unexpected treasures, beauty and deep Catholic spirituality. 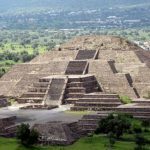 We will be visiting Mexico City, a full day in Guadalupe and many villages and historical sites in the countryside. We will study the history of the Catholic Faith in the Western Hemisphere and walk in the footprints of saints, heroes and martyrs. For the website and brochure click HERE. For our Interactive Map, click HERE. 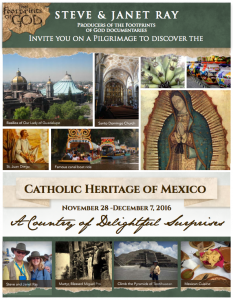 We would love to have all of you join us :-) This is a great trip full of history, beautiful sites, contact with the Mexican people and our Catholic Faith. Great hotels and meals with daily Mass. If you want more info, check out our webpage below or contact Elizabeth at emarkey@ctscentral.net or (313) 744-2530 or toll-free 1-800-727-1999, ext.150.